These are Mozart's six most popular operas and over the years they have attracted considerable attention in most of the world's important operatic venues. Glyndebourne has offered some of the finest productions of these works and here, in this lavish six-DVD set, is the evidence. In the headnote above, I have listed, in parentheses, the date of each performance after each title. All of these have been previously issued in individual DVD sets by Arthaus Musik. 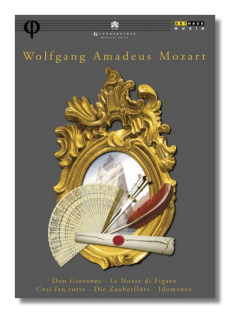 Their re-release in this multi-disc collection now is probably designed to coincide with the 250th anniversary of Mozart's birth. Most of the performances in this 15-hour-plus set are excellent, with Le Nozze di Figaro and Die Zauberflöte superb in almost every respect, and easily taking top honors. Idomeneo is the one effort here that must be regarded as a relative disappointment. Even it has its strengths, though, chief among them the splendid Electra of Josephine Barstow. The sound in Idomeneo is a bit shrill too, as is the case with Die Zauberflöte. Still, the sonics are not a major drawback in either production, and in the case of Die Zauberflöte they cannot detract from the otherwise fine performance features. Felicity Lott's Pamina is utterly charming, and the other cast members are nearly as good. Haitink's conducting is incisive and the London Philharmonic's playing is full of spirit. I have already reviewed this performance of Le Nozze di Figaro here at Classical Net, finding it, as I have suggested above, an utterly captivating production. It features the stellar trio of female singers – Cotrubas, Te Kanawa, and von Stade, all in excellent voice. Don Giovanni is also good here, featuring excellent performances by Horiana Branisteanu and Benjamin Luxon. Cosí is another fine effort, with a youngish cast led by Helena Donose, Thomas Allen, and the splendid Anson Austin as Ferrando. Die Entführung aus Serail is yet another strong entry here, featuring the splendid trio of Valerie Masterson, Willard White and Ryland Davies. The sound in general, except for that in the two productions noted above, is quite good, even if it is not competitive with today's state-of-the-art efforts. Most opera and Mozart mavens will find these performances and their discounted-price an almost irresistible offer. In sum then, this DVD set must be given a strong recommendation.